Donate now to change lives this Easter. Time is running out, but you can still make a difference! We’re committed to accountability. You can trust that your donations are handled with care. 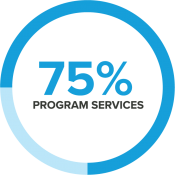 75% of our annual budget goes towards providing direct care for the hurting in our community. Give a ticket of hope! SEE OUR LATEST TV SPOT!